The Complete Works, as the title of this film, alludes to a work in which Nichol typed out on a page all the letters and signs as they appear on the keys of the typewriter with the footnote “any and all permutations of the above listed elements.” Complete works anthologies presume to collect the life’s work of an author. .
Nichol’s The Complete Works imagines his life’s work as permutations of the signs available on the keys of a typewriter. This is not simply the alphabet. 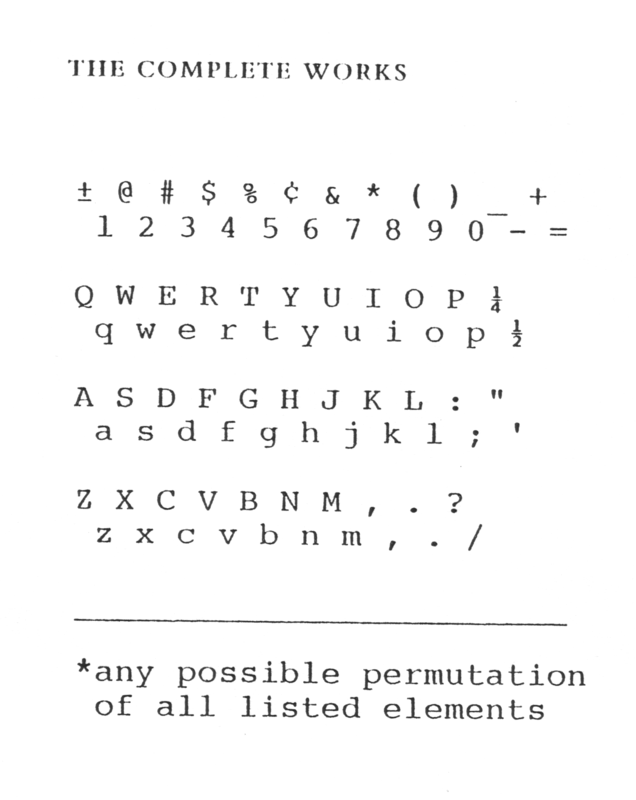 It is specifically the alphabet as it is laid out on a typewriter, which divides letters, numbers and punctuation into separate keys, and standardizes the spacing, size and font. The typewriter transforms the act of writing into an act of selection and combination. As Nietzsche put it, “Our writing tools are also working on our thoughts.” In Nichol’s The Complete Works, he emphasizes the poem as mediated by the tools used to create it. The poem is always mediated — always a part of something else — as opposed to being a “pure” or “true” expression. This is the basis of how I approached adapting Nichol’s work to film.